The boat pushed off from the dock right at sundown, the sky to the west still blazing like molten gold. But it was the moon rising in the east that held the attention of the boat’s passengers, a swollen disk of silver rising into the twilit sky, casting its enchantment on this midsummer night. Gliding with the river’s swift current, the hired boatmen barely had to lift their oars out of the water at all. With experienced hands, they guided the sleek vessel along the curves of the river, maneuvering it neatly under bridges and past glowing beacons that marked a safe course through the crowded waterways. The Frog sat in the prow of the boat, leaning out over the water, eager for the first glimpse of their downstream destination. Every so often, when it caught a rill of choppy current, the boat dipped down low and water splashed him with its cool fingers, making him laugh. He turned his head to grin at her, but of course she couldn’t see him, because of the mask, so he went ahead and stuck out his tongue, too, something he would never have dared at home. Not that she would have cared, but his father would have given him a whack with his biggest spoon if he’d caught him at it. It was just one of the reasons he loved the sculpted paper mask, with its bulging eyes and pink tongue lolling out the side of the too-wide mouth. It had been a birthday present, just two days past. You had to be thirteen to go to the Triennial masquerade, and he’d made it just under the beam. He couldn’t wait to discover all the delightful entertainments the ball had waiting for him. Despite her words of warning, the Princess looked just as excited as he was. She was dressed in an old-fashioned looking warrior’s outfit, with a sweeping surcoat of blue, tall boots, and bits of armor strapped onto her arms and shoulders. She even had a sword at her side, which was okay for tonight, since she was supposed to be Daena and it wasn’t a real sword anyway. Her mask was an intricate fretwork of gold wire winding over the upper half of her face before spreading out in two wings that wrapped around her head. “If he falls in, he can just swim the rest of the way,” said the Ghost from further back in the boat. “Like a good little tadpole. “I’m a frog!” the Frog snapped back, and emphasized his point by hopping, frog-like, where he crouched on the prow. The whole boat rocked forward when he did it, alarming all the passengers, but especially the Ghost, who grabbed at the gunwale with an oath. If anyone else had asked it of him, he would have refused, but the Barbarian had a strange pull on the Frog that he was only just beginning to understand. He didn’t care much for the mask he was wearing—the leather was shaped like some kind of animal skull, with a crest of spiky feathers and embedded metal thorns instead of teeth. But it was paired with a sleeveless leather tunic that showed off his long, tan arms, lean with muscle from hours practicing with a sword. He succumbed to temptation, and scrambled back to the benches to take the offered seat. The Ghost was still glowering at him. “Are we going to have to babysit this tadpole all night?” he asked. “I’m a frog!” he protested again, and sprang to his feet. Or at least, tried to. The Barbarian and the Bull each caught him by a shoulder and forced him back to the bench before he could make the boat rock again. “Stop provoking him, Romeric,” the Bull said sternly. “Pash can take care of himself at the ball. All we have to do is make sure he gets back in the boat at the end of the night. Right?” Even through the the eyes of his mask, the Frog could feel the weight of the Bull’s gaze weighing on him, full of expectation, and he nodded his head quickly. Of all the older boys’ costumes, he liked the Bull’s the best. The stern countenance of the bull was shaped in deep brown velvet, and the horns set with chips of obsidian that glittered in the silver moonlight. The clothes he’d chosen to go with it were almost ordinary in cut and style, except that they were made of brown velvet, too, and covered with embroidery, a colorful, swirling pattern of vines and flowers that was sumptuous and ornate, a design that drew the eye with its intricate complexity. “Is there really going to be a fight tonight?” he asked, turning away from the surly Ghost. The Frog shrugged, but didn’t say anything. The truth was he’d overheard his father the cook talking about it with one of the housekeepers, who had overheard the boys talking about it a few days beforehand. But you weren’t supposed to gossip about people in the House, no matter what role they served. He wasn’t going to get anyone in trouble for talking. “You don’t even have a weapon,” the Bull pointed out. The Ghost burst out with a startled laugh. “You’ve got spirit, tadpole,” he said, and punched him in the shoulder. The Frog beamed under his mask. The Ghost clouted him in the arm again, and then the Barbarian tossed an arm companionably around his shoulders. His face flushed hot and he was even more glad of the mask then he was before. He was just thinking that maybe he wasn’t in such a rush to get to the masquerade after all, when one of the boatmen called out, “Palace Bridge” and, ahead of them on the river, a fantastic panorama of lights and colors hove into view. Sieur Eristan did not look up from the letter he was reading, so he missed the apprehensive looks his students shot back and forth across the table after he spoke. Breakfast at Fleuracy House was not formal, but Eristan expected the three young men he mentored to arrive promptly each morning, prepared for whatever lessons or duties he might assign for the day. Romeric, still hazy-headed from last night’s misadventure, had barely made it on time this morning. Barris slunk in some time later, with Eristan’s daughter, Neda, right on his heels. She looked ever bit as weary as Romeric felt, making him wonder what she’d been up to while they’d been out. Surprisingly, Tierce had been the first one at the table. He’d been barely conscious when they’d dumped him on his bed the night before, still mumbling about his “wish cat” and stinking of sour beer and vomit. Romeric had been certain they wouldn’t see him all day, but here he was, washed and groomed and neatly dressed, besides. Discipline had its virtues, he supposed. At least he looked miserable, staring at the plate of food in front of him with an expression that was equal parts queasy and mortified. The awkward silence at the table dragged out, until Eristan eyed them over the top of his paper, eyebrows creased in critical appraisal. “Yes, sir,” Barris answered finally, far too late to be at all useful in defusing suspicion. “I see,” Eristan said. “I appreciate the consideration.” He looked at them expectantly, but no further questions were forthcoming. Frowning faintly, he turned his attention to his meal. The scraping of utensils on plates was the only sound in the room for several long minutes. Breakfast this morning was the usual: smoked fish, crusty bread, summer-fresh melon and berries. Romeric had no appetite, but he forced himself to swallow a few mouthfuls for appearance’s sake. Barris, too, made an unenthusiastic show of trying to eat, though he was mostly just pushing food around his plate. Tierce didn’t even pretend. He kept his hands in his lap and his gaze down, food untouched in front of him. Romeric eyed him sidelong, wondering how much he actually remembered about the night before. They had agreed to keep the events of the night to themselves. With no witnesses and only a mangled, nearly unidentifiable corpse as evidence, it seemed unlikely that anyone would believe they’d been attacked by some kind of magical beast in the middle of the city. If it weren’t for the deep scratches on his arm, Romeric wasn’t sure he would believe it himself. “We were all drinking,” he’d pointed out. “If we tell anyone, they only thing they will hear is that we killed a cat.” It was not a reputation any of them wanted to have to live down. Neda, sitting on Romeric’s right, cleared her plate and took up a second helping for herself. Otherwise, the silence persisted, and Sieur Eristan seemed to grow increasingly irritated. Finally, he set down his fork and knife with an indignant huff. “It was a wrouke, if anyone is curious,” he said. Romeric didn’t recognize the word, but clearly Barris and Tierce did, judging by the way their faces drained of color. Neda, too, sat up with a sudden, sharp interest. “What is a wrouke?” he asked, the unfamiliar Rhemish word uncomfortable in his mouth. “What happened?” Neda leaned forward, eager to hear the story. “Did they find it?” Romeric was fairly certain he already knew the answer to that question. “They don’t know who killed it?” Barris asked. His face was twisted into an expression of consternation which would have been comical if Romeric hadn’t been feeling exactly the same thing. Whoever was responsible. Now would be the time to speak up, wouldn’t it? Barris or Tierce would say something, Romeric was certain. Claim this notable deed on their behalf. But neither of them said a word, and neither did he. Self-consciously, he tugged at the cuff of his right sleeve, making sure the long scratches on his forearm were hidden from view. He tried to be furtive about it, but Neda, ever perceptive, saw him do it. Her eyes narrowed in suspicion. “Yes, sir,” they chorused. If Eristan noticed the lack of enthusiasm in their responses at the prospect of hours of intense physical exercise, he paid it no mind. As soon as he was out of the room, Neda made a grab for Romeric’s right arm and pushed up the sleeve, revealing the angry red lines running up to his elbow. “Is that a cat scratch?” she demanded. With a deft twist, Romeric extricated his arm from her grip. He fixed a lewd smirk on his face that he didn’t feel at all but hoped was convincing. “I really think she would not like to be called a cat,” he said, adding a sly wink for emphasis. Barris answered by shoving bread into his mouth. When she glared at him, he shrugged as if he had no clue what she was talking about. Tierce wouldn’t even look up at her. With a wordless sound of frustration, she smacked her hands on the table, hard enough to make the dishes rattle with her fury. She stormed out, leaving the three boys alone in the dining room, each pondering their experience the night before, and what they had just learned about it. They had agreed to keep the secret out of shame, but now it turned out there was nothing to be ashamed of, after all. They had fought a monstrous beast, a battle more desperate than epic, perhaps, but why stay quiet about it now, when they could be lauded as heroes? Tierce began to laugh. It was not a particularly exuberant laugh, more of a hopeless snigger. Romeric looked at him, wondering if he was still drunk, or maybe insane. Tierce met his gaze with a glint in his green eyes, and just said one word. Romeric snorted, and Barris choked on his mouthful of bread, spewing crumbs across the table, which only made Tierce laugh harder. And then they were all laughing, because, really, what else could they do? They laughed long enough and loud enough that Neda came back to give them a dirty look. Romeric understood then why none of them had spoken up when they had the chance. Rewards and acclaim were all well and good, but this bond between them now, a bond formed in blood and steel and secrets, that was something worth much, much more. Every Gatehouse was built with one purpose: to impose order on the wild energies that spewed through the empyreal Gate and into the world. Even amid the opulent and unconventional architecture of the Corregal Gatehouse, that sense of order was absolute, apparent in every aspect of its design. in each sharp corner, every measured archway, even the placement of the windows in the high gallery overlooking the assembly hall. For most people, the effect was as comforting as walking into a mother’s embrace. Jaciel Oura was not one of those people. Her skin prickled whenever she came to the Gatehouse, and her teeth itched. More irritating than painful, she often likened the sensation to having fallen asleep on an anthill. Once, at the urging of a sympathetic cleric, she had tried to overcome the problem by spending more time at the Gatehouse instead of less, and volunteered for a year of service as an acolyte, hoping the constant exposure would inure her to the discomfort. But by the end of the first week, her hair was standing on end all the time, and after a month she was practically sparking whenever anyone so much as touched her. She said goodbye to the Gatehouse soon after, and made it a habit to visit as seldom as possible. Needless to say, it was not the place she would have chosen for a meeting, but her employer had insisted. And, naturally, her employer was now late. She took refuge in a window embrasure to wait. The assembly hall, which bridged the river itself, was crowded at this time of day, and no one paid her much attention. She watched the people coming and going, making their petitions at the three alters to the Hands of the Broken God, some silent, some singing, some smiling, some weeping, depending on the need that had brought them here. Priests and priestesses moved among them, providing guidance and support as they might. Twice, she saw them usher ill or injured individuals towards the healer’s sanctuary, when a more intensive ministration was required. Meanwhile, members of the Bell Guard patrolled the periphery, more an honor guard than from any real need to keep the peace. The only good thing about having to be here was that her arm was already starting to feel better, as being closer to the gate’s power worked to ease the discomfort of her wound, even without a prayer or ministration. Her leather coat had taken most of the damage from the girl’s small knife, leaving only a shallow, two-inch gash in the flesh of her bicep. She had cleaned and bandaged it herself, and would not have sought healing at the Gatehouse for something so minor. But if she had to be here anyway, at least she was getting some benefit from it. She saw Taline Sabenay long before the Maestra of Sabenay House saw her. Taline was hard to miss, sweeping up the length of the assembly hall in an ornate gown that probably dated back to the last years of the empire, with her head held high and eyes flashing when “lesser” folk were not quick enough to hurry out of her way. Sabenay was an ancient and prestigious house (if lately reduced in fortune) and Taline was not about about to let anyone forget it. Bypassing the first of the altars – Sarrel’s was always the most crowded – Taline made her imperious way up the broad stairs to the second altar, which was dedicated to Evod. Because where else would you plan a secret meeting with your hired informer than at the feet the Grey Watcher? Jaciel wondered why the woman insisted at playing games of intrigue when she was so ill-suited for subtlety. She waited until Taline had lit a candle on the altar, and seated herself on one of the benches surrounding it, before she emerged from her nook to join her. Dressed in a plain brown tunic with her Porter’s badge on the shoulder, she felt invisible next to the grandiosity of Maestra Taline, lost in the shadow of violet silk, rudfled lace, and embroidered trim. “I had four men waylay him on Crosslight Road, just as you asked. He was able to take them down without raising a sweat.” Granted, the men she had hired had been little more than thugs, not skilled swordsmen, but the Jurati was still young, and he’d handled the ambush with remarkable aplomb. Jaciel was not afraid to let her admiration show. Taline’s face was flushed with barely contained excitement. She had never been an attractive woman, and now, nearing the end of middle age, she eschewed the sort of quiet dignity that was normally expected of women like her. Her clothes were ostentatious, her personality more so. She said what she wanted, the way she wanted, with little regard for the conventions of polite society. There’s no time for such foolishness, she often said, in the face of all I must accomplish. It was this audacious attitude that had attracted Jaciel to her service in the first place, and kept her there despite other opportunities that now and then arose. “Can we get him away from Fleuracy House?” She had a habit of gnawing on her thumb when thinking, and she did that now, as if worrying the problem with her teeth. There was no room in Taline Sabenay for doubt, and though Jaciel could still not see how the Jurati presented any kind of solution, she could not deny the force of her employer’s belief that he would. “No, Maestra, I will not,” she said, choosing to trust in the vision, even if were not her own. 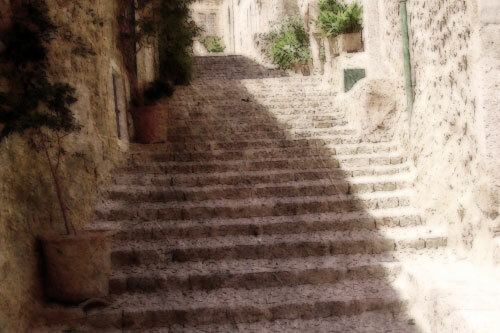 “Where is it we are going, ailenia?” Romeric asked again as he followed Calette up another row of steps. He hadn’t been paying attention. The river was behind them now, with all its cursed, confusing bridges, but the maze of terraced streets that climbed the hillside was no less a puzzle to him. “It’s not much farther.” She tightened her grip on the fabric of his shirtsleeve. She had latched onto him like that back on Drennan Bridge – not his arm, just the sleeve – and not let go since, fingers twined in the fabric as if she was afraid he’d get away. She led him through the city this way, weaving through the crowds with unexplained urgency. Every so often she’d point to some notable landmark and name it for him, but she never told him where they were going. The road they traveled now was more stairway than street, broken every few hundred steps by wide terraces that allowed access to side streets and rows of modest shophouses. She stopped now, several steps above him so that their heights were equal. Smitten, he thought, as she stared into his eyes again. Her own were a dusky gray, with drooping eyelids that made her look only half awake, still lost in some dream of the shifting sunlit river. He couldn’t help smiling at the attention, and mirrored her scrutiny with his own, intense and intimate. It made her blush, which made him smile more. Visibly flustered, she turned away and began to climb again. “What does it mean?” she asked as she led him upward. “Ailenia?” Her tongue tangled on the unfamiliar word. “It means…’ Romeric hesitated before settling on a suitable translation. “Dear.” A more accurate description would have been woman I plan on bedding very, very soon, but he wasn’t sure how she’d respond to that just yet. He knew he was grinning ridiculously as he let her pull him along, but he couldn’t help himself. He had not had much opportunity to meet many young women in this new city. Those to whom he’d been introduced were different than girls at home, cloaked in a reserve of propriety that he hadn’t yet figured out how to penetrate. Neda was off limits, of course. Her father had made that clear from the start. If even the hint of a romantic notion came to Sieur Fleuracy’s attention, Romeric would find himself badgeless and with nowhere to go. Barris and Tierce were hampered with the same restriction – not that it had stopped either one of them from falling in love with her. It was amusing, really, watching the pair of them struggle to hide their affections. He suspected they weren’t fooling anyone but each other. It had been Barris who sent him to the wrong bridge. Whether it was a welcome-to-the-neighborhood joke or some more malicious intent at work, Romeric didn’t know. Either way, he would have to thank him for it later. If it hadn’t been on the wrong Drennan Bridge he never would have met Calette. The fact that she was Cael Averre’s sister had nothing to do with his sudden affection. He dismissed that idea the moment it popped into his head. Oh, he had to admit a certain sense of satisfaction at having stuffed the blustering prick’s self-importance back down his own throat the two times they’d met – some people were just asking for it – but aside from Barris’ gloomy predictions of retribution, he’d not given Cael a second thought since the day on the river. No, there was nothing perverse in sudden desire to woo his would-be adversary’s sister. He just liked her. A lot. Because he was busy falling in love, he wasn’t paying that much attention to where they were going. Which is why, when he stopped abruptly in the middle of the next terrace, it took him a moment to figure out what had jerked his attention away from her. “There are no people,” he realized. Though two major side streets intersected with the stair-road here, and a number of prosperous looking shops faced the square, there was not a single person in sight – not even a peddler, or a beggar, or a distant passerby. No one. Calette frowned, looking more confused than worried. Impatient, she pulled on his arm again, but he brushed off her hold and reached for the sword at his hip. This time, she listened. With a look of fear settling over her lovely features, she dashed past him, back the way they’d come. Smart girl, he thought. At least they knew there were people back that way. He pulled his sword from its scabbard and turned to face the pair of assailants who were coming at him quickly now. He felt his heart quicken in anticipation as they showed their own weapons. But he wasn’t afraid. Not for himself, at any rate. After all, he’d fought at Warden’s Shore. The first one to come at him was the biggest, dressed in roughspun clothes with a scarf tied over the lower part of his face to hide his features. His sword was just as rough, big but with no finesse to it’s lines, and probably no strength in its forging. But it could kill him just as dead if given the opportunity. His attack came fast, sword heaving over the shoulder in a downward arc that Romeric flicked away with his own blade as he dodged out of reach. Rather than follow up with an attack of his own, he let the man’s momentum carry him past, then darted around to confront the second attacker coming up behind. This one was dressed much the same as the first, but with a full mask covering his face. Romeric didn’t need to see his face to tell he was surprised to find himself embattled so quickly. His sword, prettier than the first man’s, jerked up in surprise, just as Romeric had expected. With a neat twist of his own blade, he knocked the weapon from the assailants hand and followed it up with a jab that pierced the man just below the ribcage – not deep, but enough to take him out of this particular skirmish. Romeric slid past him as he fell, turning on the ball of his foot to face the first attacker once again, just as he heard a cry of dismay from Calette. With a glance in that direction he confirmed what he had expected – a third assailant had come up the stair behind them. Calette flailed against him, but could nothing to help her until he’d dealt with his own opponent. The big man came at him, more cautiously this time, but with no less energy behind his blows. Romeric’s slender Arrenal blade was surprisingly resilient against the broad gash of steel that was his opponent’s sword – but that’s why you paid so much for a weapon like his. He knew he was better armed, and after the first flurry of exchanged blows, he knew he was the better swordsman. All the same, there was no playfulness in his defense this time, not like when he had dueled on the Bridge. Each time he swung his sword it was in deadly earnest. Twice, he cut the man with the edge of his blade, once on the arm, once on the face, while keeping himself clear of the reciprocating blows. The third time his sword connected with flesh, it was a deep thrust into the man’s shoulder that made him jump back with shout of pain. Romeric wrenched his sword free and swung low as the big man’s sword clanged to the ground. A slice across the hamstring sent him toppling to the ground. Romeric did not watch him fall, but whipped around to find Calette. There were three swordsmen blocking the way down the stairs now – no, two men, swords at the ready, and a woman who had Calette in her grasp. Calette, her dark hair in even greater disarray then it had been, looked more perturbed than dismayed. He paused, not sure if rushing forward would endanger her more than she already was. With a sharp cry, the woman jerked away from Calette who – somehow, Romeric saw – had a knife in her hand. A knife she’d just plunged into the arm of her captor. The two swordsmen paused, and in their moment of confusion Romeric charged forward. He swung his sword at the head of one, and kicked at the kneecap of the other. The sword missed, but a satisfying crunch resulted when his foot connected with the kneecap. He did not pause to gloat, just caught up Calette’s hand and ran. They were halfway to the river before he let them slow, both of them panting as he became aware that the wary looks he and his sword were getting from the now-plentiful afternoon crowd of passersby. Huffing, he slid it back into its scabbard before anyone thought to make a scene. Calette’s knife had already disappeared. Women, he remembered, were not allowed to carry blades in Corregal. “Are you all right?” he asked, trying to catch his breath. His heart was still racing from the brief exertion, and now that the threat was receding – there was no sign of pursuit – he allowed himself to feel the thrill of battle just past. He’d been good, and he knew it. Four against one, if you didn’t count the woman, and they hadn’t come close to touching him with their weapons. He beamed with exhilaration. Romeric cursed himself inwardly. He had totally overlooked the missing badges in the midst of the fight. It was such a peculiar Corregal custom, this badge-wearing. He’d barely even noticed Calette’s badge (her lips were so much more worthy of his attention). Now he realized for the first time that the badge for Fleuracy House that he himself wore made him immediately identifiable to anyone who saw him. The thought was more than a little unnerving. Shouts sounded from further up the road. A smile fluttered across Calette’s face, the first she’d actually shown him since they met, and he felt his heart lurch in response. At that moment, she could have told him to fly across the river and he would have attempted it. “I’m going to paint you!” she laughed, her grey eyes sparkling like the river. And then she was gone, darting between one passerby and the next before he even had time to react. But it was useless. He couldn’t see her anywhere, and he could not begin to guess which direction. It doesn’t matter, he consoled himself. You’ll see her again soon. Two days was not so long to wait to see the woman you were in love with. Assuming he could find his way to Averre House. And then he swore, and smacked himself in the the forehead with the heel of his hand. The bridge! She had said she would show him where the right Drennan Bridge was, so he could deliver the parcel Sieur Fleuracy had entrusted to him. But now she was gone, and he still had no idea where he was supposed to go. He wasn’t even sure he could find his way back home from here. Grumbling at himself and at this thrice-cursed maze of a city, he straightened his tunic and adjusted the weight of his sword belt around his hips. Then, picking a direction at random, he headed off to lose himself once again in the City of Bridges.